Texas has enacted a new hardline law to crack down on illegal immigration, signaling the re-emergence of restrictionist activism at the state level that stalled in 2012 amid adverse rulings by federal courts. The Texas law, which takes effect September 1, comes on the heels of the Trump administration’s policies to expand immigration enforcement in general, and in particular to penalize so-called sanctuary jurisdictions that limit cooperation with federal immigration authorities. While Texas was the first state to pass a sweeping law focused on illegal immigration since the presidential election, at least 32 other states have introduced immigration enforcement bills. The movement indicates a return to an era that began approximately a decade ago and ended when the Supreme Court struck down key provisions of Arizona’s controversial Senate Bill (SB) 1070 law. Echoes of the Arizona law, which fostered a number of copycat laws in the Southeast, can be found in the Texas law, SB 4. Designed to end the sanctuary policies of some jurisdictions, the Texas law also allows state and local law enforcement officers to inquire into the immigration status of noncitizens who are detained or arrested, as well as that of victims or witnesses to crimes. Already, three lawsuits involving the Texas law have been filed, and the legal parallels with SB 1070 mean the outcome and fallout of the Arizona law will be carefully examined in the Texas case. Sanctuary jurisdiction: Though widely used, the term has not been defined in law and represents a catch-all phrase for states and localities that have enacted a range of policies and practices to limit their cooperation with U.S. Immigration and Customs Enforcement (ICE). Detainer: A request by ICE for local and state law enforcement agencies to hold deportable noncitizens in their custody up to an additional 48 hours, allowing ICE to pick them up. Before 1996, immigration enforcement was largely seen as the exclusive domain of the federal government. In enacting Section 287(g) that year as part of the Illegal Immigration Reform and Immigrant Responsibility Act, Congress allowed the federal government to enter into agreements authorizing state and local officials to perform certain immigration enforcement functions. Participation in the program began after the September 11, 2001 terrorist attacks, and then accelerated beginning around 2007, following increased local pressures to address illegal immigration during the recession. A parallel trend emerged in state legislatures, where lawmakers introduced restrictive bills specifically designed to make their states inhospitable to unauthorized immigrants. These omnibus bills spanned multiple areas, including immigration enforcement, employment verification, and access to public benefits. Colorado kicked off this trend in 2006 with SB 90, which restricted local governments from enacting sanctuary policies, conditioned state grants on their compliance, and required local law enforcement officers to report to U.S. Immigration and Customs Enforcement (ICE) anyone arrested for a criminal offense whom they reasonably suspected to be unauthorized. Arizona’s SB 1070, introduced in 2010, became the most widely known and influential of these omnibus immigration enforcement laws. Five states—Utah, Georgia, Indiana, South Carolina, and Alabama—quickly followed Arizona’s lead and enacted versions of the Arizona law in 2011. In 2012, states began retreating from the pursuit of restrictive immigration measures due to the perceived change in political climate and tone following the general election and because various federal and state courts had blocked key provisions of these laws. Momentum ground to a complete halt after the Supreme Court in June 2012 struck down key provisions of SB 1070 in its ruling in U.S. v. Arizona. States subsequently stopped enacting restrictive immigration bills or pressing legal defenses for challenged provisions, and Colorado revoked its law in 2013. What Precedent Does the Arizona Law Set for SB 4 and Similar Legislation? The Supreme Court held that the first three provisions above (Sections 3, 5(C), and 6) were preempted by federal law. The justices did hold that it was premature to enjoin the fourth provision, Section 2(B), without some evidence that its enforcement would conflict with federal immigration laws. In September 2016, six years after the Supreme Court ruling, the legal challenge to Section 2(B) was finally resolved when the state of Arizona entered into a settlement with a coalition of immigrant advocates, civil-rights organizations, and other plaintiffs challenging SB 1070. As part of the settlement, the Arizona Attorney General filed an advisory in federal court outlining the limitations on enforcement by state and local law enforcement. Those limitations include restricting officers from prolonging a stop, detention, or arrest solely for the purpose of verifying immigration status, and restricting officers from contacting, stopping, detaining, or arresting individuals based on race, color, or national origin, except when part of a suspect’s description. Allowing state residents to bring legal action against officials or jurisdictions that have adopted or implemented policies that limit or restrict the enforcement of federal immigration laws. 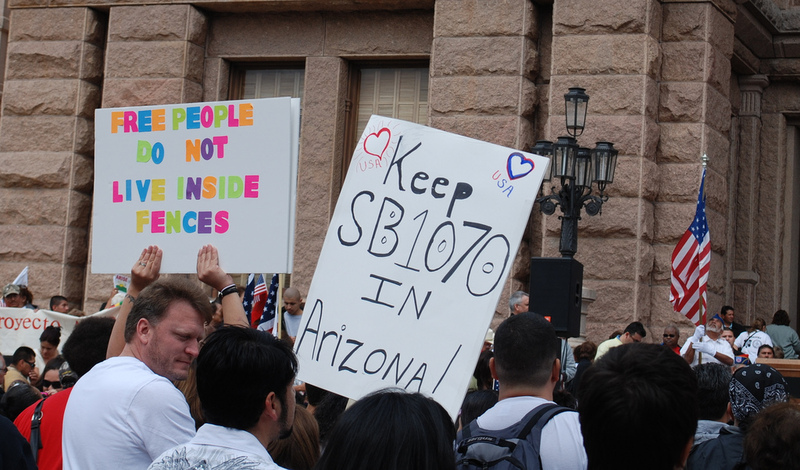 Beyond the legal obstacles, other factors affected Arizona’s enforcement of SB 1070. A national backlash against the law damaged the state’s tourism and convention industry, to the tune of at least $45 million according to one study; spin-off effects brought the losses into the hundreds of millions. Amid the political fallout, the law’s author, state Senator Russell Pearce, was removed in a special recall election—the first state lawmaker in Arizona history to be recalled. The state also endured steep litigation costs defending the law. A New Trend of State Activism? Enacted five years after the Supreme Court’s ruling in U.S. v. Arizona, the Texas law represents a new resurgence of an old trend. That Texas is leading the charge is not surprising: Even prior to SB 4, Texas showed interest in being a leader among states favoring limits on immigration. In 2014, Texas led a coalition of 26 states that successfully challenged the Obama administration’s Deferred Action for Parents of Americans and Lawful Permanent Residents (DAPA) program, which would have shielded from deportation as many as 3.7 million unauthorized immigrant parents of U.S. citizens and legal permanent residents, as well as expansion of the Deferred Action for Childhood Arrivals (DACA) program. More recently, Texas responded proactively to the Trump administration’s campaign against sanctuary jurisdictions. Shortly after President Trump took office, Travis County Sheriff Sally Hernandez, whose jurisdiction includes Austin, announced that her office would not honor ICE requests to detain noncitizens unless there was a warrant issued by a judge for their arrest, or unless the charge involved murder, sexual assault, or human smuggling. Governor Greg Abbott immediately sent Hernandez a letter threatening to withhold state funding if she did not reverse the policy, and eventually canceled $1.5 million in criminal justice grants promised to Travis County. Perhaps in response to Hernandez’s policies and to show support for the new president’s immigration stance, Abbott endorsed SB 4 and eventually signed it into law—doing so in a signing that was live-streamed on Facebook. SB 4 takes a page out of the Arizona playbook, forbidding local jurisdictions and college and university campuses from adopting sanctuary policies. It restricts jurisdictions from preventing their officers from inquiring into the immigration status of individuals who are under lawful detention or arrest, or prohibiting federal immigration officers from entering and conducting enforcement activities at a jail. It requires law enforcement agencies to comply with ICE detainers. The law carries strong repercussions for jurisdictions and colleges that pursue sanctuary policies or practices. It enables elected or appointed officials to be removed from office if they refuse to comply with the law. It also makes it a misdemeanor for sheriffs, chiefs of police, or constables to fail to comply with an ICE detainer. Further, the Texas law contains what has been coined as a “show me your papers” provision. In addition to forbidding jurisdictions from preventing officers from inquiring into the immigration status of detained or arrested individuals, in certain circumstances it allows officers in the process of investigating a crime to check the status of victims or witnesses. Specifically, the inquiry must only occur if (1) it is necessary to investigate the offense, (2) it is needed to provide the victim or witness with information about a right to a visa that may arise from their cooperation (i.e. the U visa or Violence Against Women Act visa), or (3) if the officer has probable cause to believe that the victim or witness has engaged in conduct constituting a separate criminal offense. Currently there are three ongoing lawsuits related to Texas’s SB 4, two challenging aspects of the law, one seeking affirmative court endorsement of its constitutionality. The same day it was signed, Texas Attorney General Ken Paxton filed a complaint with a federal district court in Austin asking for a declaratory judgement on the constitutionality of the new law. The action effectively seeks to derail challenges to the law, with Paxton declaring "SB 4 is constitutional, lawful, and a vital step in securing our borders." The following day, the city of El Cenizo and the League of United Latin American Citizens (LULAC) sought a preliminary injunction against enforcement of the law. El Cenizo has an 18-year-old ordinance restricting the ability of local law enforcement to interact with ICE. The plaintiffs are asking the federal district court in San Antonio to declare SB 4 unconstitutional as preempted by federal law and as a violation of the Tenth Amendment. On May 22, El Paso County filed a lawsuit in U.S. district court in San Antonio against the governor and other Texas officials, arguing that SB 4 violates the 4th and 14th Amendments and Supremacy Clause of the U.S. Constitution. El Paso County is in a unique situation because it agreed in 2006, as part of a court settlement, to write policies prohibiting sheriff’s officials from enforcing federal immigration law. SB 4’s “show me your papers” provisions may also be challenged on constitutional grounds in the three legal challenges. These sections are distinct from SB 1070, which required officers conducting a stop, detention, or arrest to verify an individual’s immigration status if they had a reasonably suspicious that the individual is unlawfully present in the United States. In Arizona, the Supreme Court ruled that it was premature to rule on Section 2(B) without an examination of how the section would be applied, but did identify potential concerns about its constitutionality, including if an officer detained individuals for the sole purpose of verifying immigration status. It seems likely that a court would rule similarly in the Texas case. Thus, the provisions are likely to survive legal scrutiny in the absence of evidence of harm resulting from implementation of the sections. In addition to federal preemption, the courts will have to determine whether the provisions of SB 4 violate state preemption, i.e. the relationship between the state and local laws. This applies to sections of the law that restrict local jurisdictions from adopting certain policies and practices. For example, the Texas Constitution gives broad self-governing rights to jurisdictions with more than 5,000 residents to implement local laws and ordinances not addressed by state laws. However, if an issue is addressed by state law, that law preempts local laws. This likely means that to the extent SB 4 conflicts with local laws and ordinances, the courts will find the state law is preempted. Since Trump’s election, many states have followed Texas and are considering or have enacted immigration-focused legislation. According to the National Conference of State Legislatures, as of May 8, 2017, 24 states were considering anti-sanctuary bills and four had passed such legislation during their 2017 legislative sessions. Georgia and Indiana enacted laws restricting postsecondary institutions from adopting sanctuary policies. Mississippi went a step further, prohibiting local jurisdictions and postsecondary institutions from adopting or maintaining sanctuary policies. In all likelihood these laws will face legal challenge. The outcome of challenges to the new wave of state activism is difficult to predict. First, there is an altered legal reality. The challenge to SB 1070 was brought by the Obama administration, a situation unlikely to occur in the Trump administration against states seeking to mandate compliance with ICE or toughen penalties against illegal immigration. As a result, it is likely that all challenges to such state laws will instead be brought by private parties and by some local jurisdictions. The legal battles are also occurring in a time when the political climate on immigration enforcement at the federal level—and in many states—has hardened. However, many courts have also shown resistance to upholding the President’s actions on immigration, which may influence at least some as they grapple with this latest set of state activity. Temporary Protected Status Extended for Haiti. On May 22, Homeland Security Secretary John Kelly announced the extension of Temporary Protected Status (TPS) for Haiti for an additional six months, through January 22, 2018. Haiti was designated in January 2010 after a devastating earthquake, and its designation was set to expire on July 22, 2017. Historically, the Department of Homeland Security (DHS) has granted six-month extensions only in cases when it has intention of terminating the TPS designation and allowing beneficiaries to time prepare to depart the United States. However, DHS has left open the possibility that it may terminate, extend, or redesignate Haiti at the end of the six months. Kelly did also strongly advised Haitian TPS holders to begin preparations for departure. To date, 58,700 Haitians have received TPS. District Judge in San Francisco Enjoins Trump Administration from Cutting off Federal Funding to Sanctuary Jurisdictions. On April 25, U.S. District Judge William H. Orrick III in San Francisco issued a nationwide injunction temporarily halting the Trump administration’s plans to withhold federal funds from so-called sanctuary jurisdictions. The lawsuit was brought by San Francisco and Santa Clara County, which argued that President Trump’s executive order on interior enforcement, issued on January 25, was unconstitutional and would result in the loss of millions of dollars for the jurisdictions. The judge agreed, finding that the administration could not place new conditions on federal funds without congressional approval. On May 22, Attorney General Jeff Sessions published a memo clarifying that the executive order would be narrowly interpreted, applying only to jurisdictions that “willfully refuse to comply” with a federal law on information sharing between local officials and federal immigration authorities and will only limit certain grants from DHS and the Department of Justice. A few hours after the memo’s publication, the administration asked Judge Orrick to lift the injunction. The administration’s budget blueprint for fiscal 2018, issued earlier this week, seeks to amend federal law to ensure that jurisdictions comply with U.S. Immigration and Customs Enforcement (ICE) detainer requests and would expand the information that state and local jurisdictions are required to share with ICE and DHS regarding the nationality, citizenship, and other details about individuals in custody. At least four other jurisdictions have sued the administration regarding sanctuary city funding restrictions, including Seattle; Richmond, California; and Chelsea and Lawrence, Massachusetts. Two U.S. Courts of Appeals Hear Oral Arguments on Trump Travel Ban. This month, the Fourth and Ninth U.S. Circuit Courts of Appeals heard oral arguments related to President Trump’s March 3 executive order temporarily suspending the U.S. refugee resettlement program and the admission of certain nationals from six Muslim-majority countries. The administration is appealing nationwide injunctions placed on the executive order by federal district judges. On May 8, the full Fourth Circuit heard arguments in IRAP v. Trump, a lawsuit filed by current visa holders and their family members, as well as nonprofit organizations that work with refugees. And on May 10, a three-judge panel of the Ninth Circuit heard oral arguments in Hawaii v. Trump, a lawsuit filed by Hawaii and Ismail Elshikh of the Muslim Association of Hawaii. Judges in both cases questioned whether statements made by the President during the campaign and after his inauguration regarding his desire to ban admission of Muslims can be used to determine the intent of the executive order. Both circuits are expected to rule in the coming weeks. Conflict of Interest Concerns Related to President’s Family and EB-5 Spur Calls for Reform. A recent controversy involving President Trump’s son-in-law and advisor, Jared Kushner, pushed the EB-5 visa program once again into the spotlight. Kushner’s sister generated criticism after she pitched her company’s construction project to investors in China, mentioning her brother’s name and showing a photo of President Trump. During the pitch, she invited Chinese investors to take advantage of the EB-5 visa program by investing in luxury apartments in a project owned by the Kushner family. The program allows foreign investors to obtain permanent residence in the United States (i.e. a green card) if they invest at least $500,000 in a U.S.-based commercial enterprise and create jobs for at least ten U.S. workers. The program was established by Congress in 1990 to help stimulate job growth through foreign investments, but has been strongly criticized in recent years for allowing wealthy investors to “buy” their entry into the United States and amid allegations of fraud. Senators from both parties have called for reforms to the EB-5 program to reduce fraud and potential for abuse. Sen. Charles Grassley (R-IA) sent a letter to Homeland Security Secretary John Kelly urging him to implement regulatory changes first introduced during the Obama administration. Among other things, these changes would raise the minimum investment requirements to account for inflation. DHS has yet to respond to the request. DHS Has Not Conducted Interviews with Refugee Applicants since President’s Executive Order. Despite several legal orders blocking the implementation of aspects of President Trump’s revised executive order that temporarily pauses the U.S. refugee resettlement program, DHS has not resumed refugee processing since the first executive order in January. Refugee arrivals have dropped from approximately 2,000-2,200 per week during the Obama administration to approximately 900 per week, according to recent reports. Due to growing concerns regarding processing delays, a bipartisan group of senators sent a letter requesting clarification from DHS and the State Department about their refugee processing procedures. As of May 17, the United States had resettled 44,522 refugees so far this fiscal year. President Obama had set the ceiling for refugee admissions for fiscal year (FY) 2017 at 110,000 refugees, and while this ceiling was reduced to 50,000 under the March 6 executive order, that reduction has since been enjoined by a federal district judge in Hawaii. State Department Takes Steps to Subject Certain Visa Applicants to Increased Vetting. The State Department recently announced plans to increase vetting procedures for certain visa applicants. The department published a Federal Register notice requesting public comment on additional questions that will be asked of immigrant and nonimmigrant visa applicants flagged for additional scrutiny. These requests include asking additional information on travel and employment history over the previous 15 years, social media handles and platforms used over the previous five years, and the names and birth dates of family members—including all siblings, children, and current and former spouses. The notice estimates that 65,000 applicants per year would be affected by the new vetting procedures, which amounts to approximately 0.5 percent of U.S. visa applicants worldwide. The spending bill funding the federal government for the remainder of 2017 also allows the Homeland Security Secretary to raise the FY 2017 cap on H-2B temporary nonagricultural workers to, at most, an estimated 130,000. H-2B visas are currently capped at 66,000 each year, and that cap was reached for FY 2017 on March 13. This has left employers scrambling to fill seasonal positions typically held by H-2B workers, such as landscapers or amusement park attendants. Furthermore, the legislation reauthorizes several immigration-related programs, including the EB-5 investor visa, the Conrad 30 waiver for international medical graduates, and the Special Immigrant Non-Minister Religious Worker program. Maryland Attorney General Advises Law Enforcement Not to Comply with ICE. Maryland Attorney General Brian Frosh issued a guidance memo for state and local law enforcement officials regarding cooperation with ICE. The memo warns that compliance with ICE detainer requests without an accompanying judicial warrant could expose local law enforcement officials to potential lawsuits. Illinois State Senate Passes TRUST Act. On May 7, the Illinois Senate passed the Illinois TRUST Act. Modeled after California’s 2013 TRUST Act, the legislation would prohibit local law enforcement from honoring ICE detainers without a court-issued warrant. Other key provisions include prohibiting federal immigration officials from making arrests at state-funded schools and health-care facilities; preventing local law agencies from maintaining any federal registry programs based on race, color, ancestry, national origin, or religion; and blocking state and local agencies from entering into contracts with for-profit entities for immigration detention facilities other than for “ancillary services.” The bill is now being considered by the Illinois House of Representatives.